Snow Fun "Aurora Winter Week"
Have you ever been above the Polar Circle in winter and in the capital of the Russian North region - Murmansk? It is a major port-city that currently serves as a base for 15 fleets – including merchant, fishing, icebreaking and research fleets. Of course, a city-tour and visits to several interesting museums will be part of your visit to the World’s biggest city the North above the Polar Circle. But we offer you to start your holiday from taking a part in some northern activities like cross-country skiing, alpine skiing, trying out a snowmobile and having snow fun. For these possibilities we go to the town of Kirovsk which is located in a valley of the Vudjavr lake and surrounded by the Khibiny Mountains. 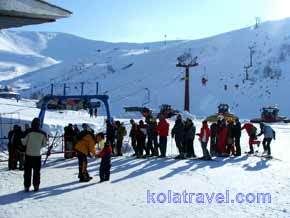 It is a beautiful northern city on the Kola Peninsula and a major mountain–skiing centre in the Northwest of Russia. Your Aurora Winter Fun is based on hotel and guesthouse accommodation. The program is full board. Day 1: Arrival in Murmansk airport in evening (better in afternoon). Transfer by bus to a lumberjack guesthouse Yolki-Palki. Dinner, sauna, overnight in two person rooms. Day 2: After breakfast our winter activities start. Everybody can ski in the snowed frozen forest and have Snow fun gliding from a top of snow hill, making snow figures, fighting with snow balls and studying how to build an ice igloo as well as try luck in ice fishing. Lunch at 1 PM. If the weather is nice the evening dinner is offered outside around a big campfire. 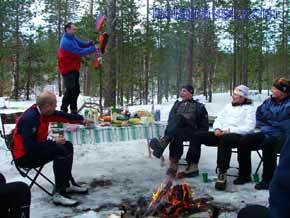 A main dish will be reindeer meat cooked on open fire. If it is too cold we go to a sitting room of the guesthouse where two big wood stoves are blazing. For lovers of hot sauna – it is located just in the yard and ready to heat you up. Overnight in the wilderness guesthouse. Day 3: Breakfast and at 9 o'clock our active program continue. 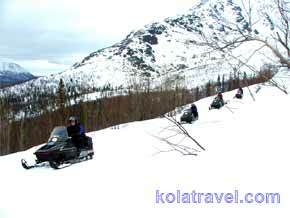 We go by bus to the start point of a snowmobile tour in Khibiny mountains. Wilderness lunch with sandwiches. Dinner at 6 PM in a bowling centre with possibility for bowling. For overnight we go back to the lumberjack guesthouse. Day 4: After breakfast we drive to Alpine slope. Those who is not experienced in downhill skiing can take a lesson from an instructor. Lunch in a restaurant at 1 PM in Kirovsk. After lunch we drive to Murmansk and check-in at a hotel. Free time. A skating possibility in the Ice Palace. Dinner at 7 PM in a restaurant "King's Hunting". Overnight in the hotel. Day 5: Breakfast at the hotel. At 9 o'clock we drive to visit the Navy Museum with its photographs, artefacts and models of the Northern Russian Navy. 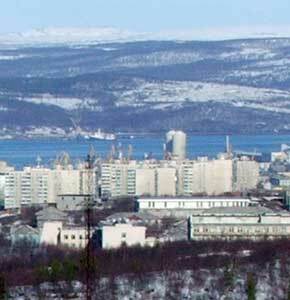 Then we have an excursion in Murmansk city including making pictures from the highest point of the city – Alesha Memorial and visiting harbour where atomic icebreakers can be. Lunch in a restaurant in the harbour. At 15:00 we come to Murmansk Oceanarium to watch a performance of Northern seals. Around 17:00 we come back to the hotel and city centre. Free time for shopping and exploring the city on your own. A skating possibility in the Ice Palace. Dinner in a restaurant of the hotel at 7 PM. Overnight at the hotel. Day 6: Breakfast at the hotel. Transfer to the airport for departure. • Visit to Northern Navy Museum. • Entrance fee to Oceanarium.